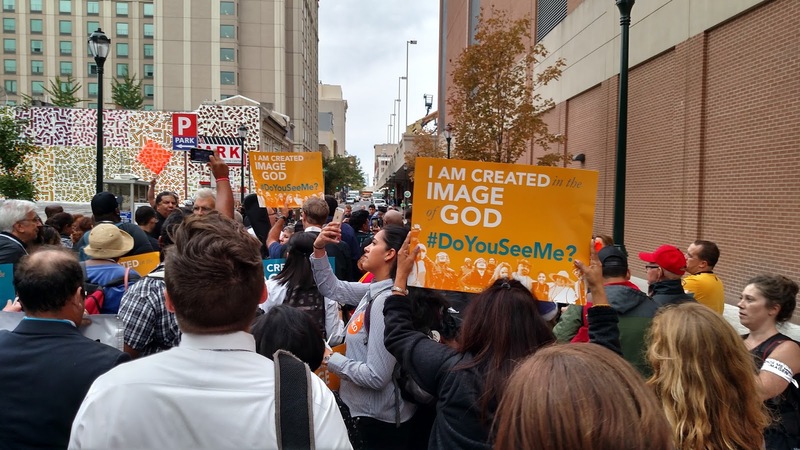 At the pre-Pope rally sponsored by the PICO Network and POWER, I participated in a modified stations of the cross march, stopping to pause, reflect and pray at the Philadelphia Police headquarters, a Federal jail and detention center, a low wage service industry store, and the site where slaves of George Washington lived. At each site we lifted up issues and causes Pope Francis has discussed: police brutality, mass incarceration, exclusion of migrants from society, low wages, racism and oppression. Protestant, Catholic, and Jewish speakers called us to continue our work of resistance to injustice and work for justice. We prayed, we sang, we listened, we marched. One of many strange things about this weekend has been the high police and military presence. In order to secure the Pope’s safety, there is a virtual military state in downtown Philadelphia. Police, national guard and bomb squad personnel are everywhere. 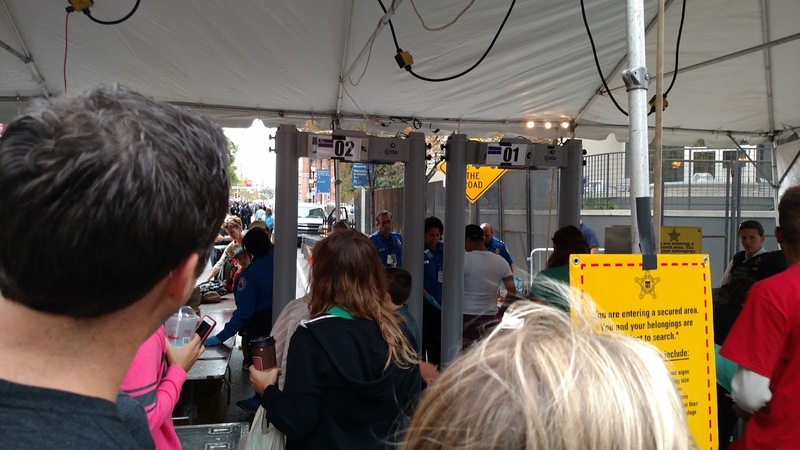 Individuals must go through security checkpoints to gain access to the downtown streets. 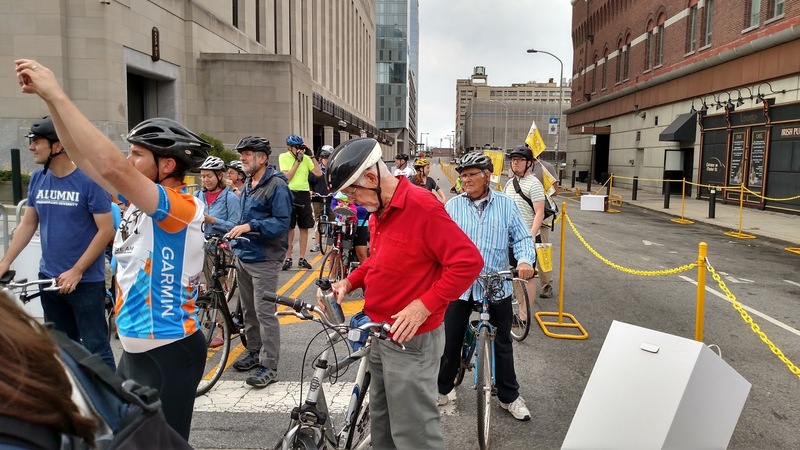 Wherever the Pope goes he is surrounded by a phalanx of Secret Service, Swiss Guard, black vans and police on bicycles as he smiles and waves from his Pope-mobile. So I find myself with a bit of a Pope paradox. 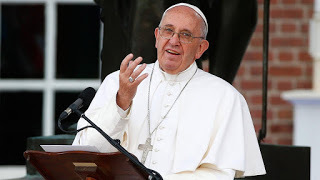 I do not appreciate the elevation of the male clergy of the Roman Catholic Church at the expense of others, but I am drawn by the powerful call to justice to the social teachings of the church and liberation theology orientation of Pope Francis. The city has an air of peace, unity and serenity while it is dominated by military and security personnel. Mostly though, it is Pope Francis, himself, stopping his vehicle to kiss and bless babies, waving and smiling intently at all whom he passes, and taking time to listen to those fortunate few who have a chance to talk with him personally. Even while his robes, his throne-like chair, the royal Catholic spirituality and the overwhelming presence of security surrounding him seems to defy the very spirit of Christ he is said to represent, at the same time his word, countenance, and interaction with people seems to embody that same spirit of Christ. 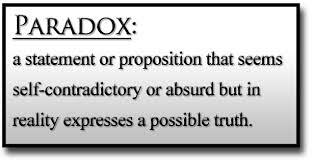 Sometimes the most important things in life are contained in paradox – an apparent contradiction pointing and embodying a deeper truth. If Pope Francis, the so- called “people’s Pope” can somehow communicate the radical truth of Jesus love and concern for justice, while challenging the power-brokers of governments and corporations, then he is a paradox I will embrace and continue to ponder.